Well, a lot has happened since the auction of a nearly complete Tarbosaurus was halted last May. At the end of December, Eric Prokopi surrendered his claim to the Tarbosaurus and other Mongolian and Chinese dinosaur fossils in his possession, and pleaded guilty to several charges surrounding the Tarbosaurus case. The Mongolian government is renewing its commitment to preserving its outstanding natural history heritage by creating a new dinosaur museum in capital city Ulaanbaatar, and several museums elsewhere in the countryside. 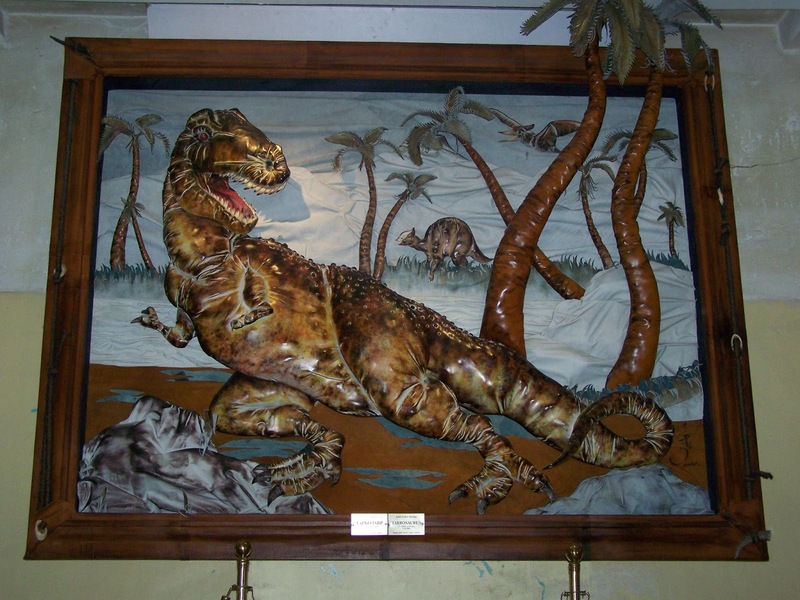 I hope the awesome leather Tarbosaurus makes the trip to the new digs. Most recently, Paige Williams wrote an excellent article for the New Yorker interviewing many of the people involved in the Tarbosaurus case, including Prokopi. “Bones of Contention: A Florida man’s curious trade in Mongolian dinosaurs” was an illuminating read for me, despite having followed the case closely. A few things struck a chord with me, because I was surprised by some of the attitudes displayed by people who are otherwise portrayed as ‘passionate’ about paleontology. You can’t have it both ways. You can’t call yourself a ‘commercial palaeontologist’, co-opting the name of a scientific discipline, and then turn around and question the purpose or validity of palaeontology. 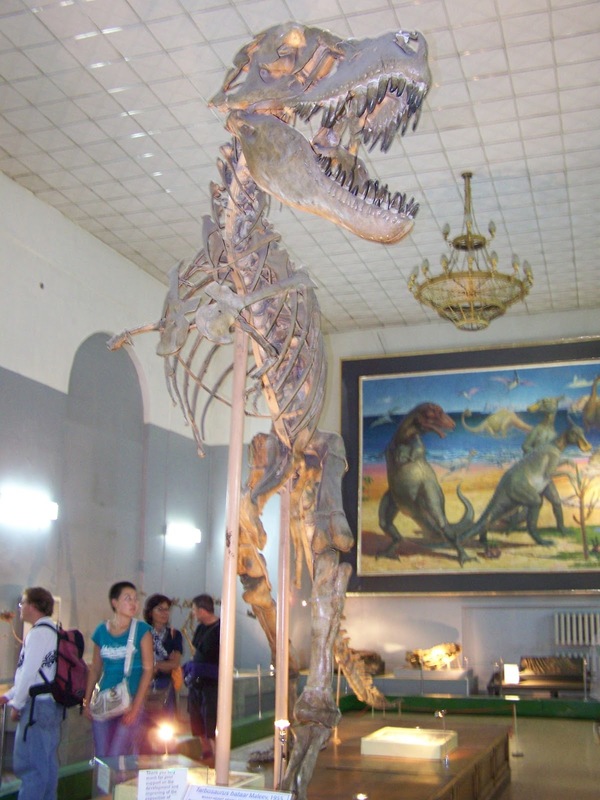 Tarbosaurus on display at the Mongolian Natural History Museum, in 2007. So look, I get it. Stealing a dinosaur isn’t as bad as murdering someone. And no, palaeontology isn’t curing cancer or finding renewable energy or solving world conflict or any of those big-ticket items. But I’d like to think we live in a world where we don’t have to funnel all of our resources into just the absolute bare minimum required to survive. I’d like to think that we have it in our hearts and our minds (and our pocketbooks) that we can study things that do not have immediate, direct, tangible, GIGANTIC benefits. I’d like to think that we live in a world where understanding nature and evolution and animals and biodiversity and our planet are TOTALLY OK things to spend one’s time thinking about. Stealing a dinosaur doesn’t have to be as bad as murder to still be a crime, and palaeontology doesn’t have to cure cancer in order to have value. I don’t know what the take-away message from this post is, but I guess all of us in palaeontology and other sciences need to keep talking to the public, keep talking to policy makers, and keep trying to inject some enthusiasm for curiosity, exploration, and critical thinking into our everyday worlds. That’s not too big a task, right? Thoughts on Tarbosaurus, part 1: in which I discuss the role of museums in conserving fossils. Thoughts on Tarbosaurus, part 2: in which I discuss the identity of Tarbosaurus and how we know it’s from Mongolia. Thoughts on Tarbosaurus, part 3: in which I discuss why fossil poaching is a bad thing. ← SVP, you’re so silly. I would argue that palaeontology dose have immediate and tangible benefits. I know of no other science than can give us predictive power into understanding what the world would be like in the event of dramatic global climate change or the complete absence of ice caps. Nor would we have any clue what biodiversity might be like under these conditions. Maybe it’s a bit of a catastrophic viewpoint, but palaeontology allows us to make predictions about events that have never happened during the human experience in a way the models of no other science can. Not only that but it offers the evolutionary background for all the life we observe today. In that sense, a neontological perspective can tell us what might have happened, but palaeontology can tell us what DID happen. Exactly, Mike! Paleontology not only gives us the perspective of what has happened, but also the valuable data of what would happen in terms of both short and long term changes on this planet without the presence of the genus Homo. In every interview with Mr. Prokopi I've read/seen he makes comments like the one you highlighted. I'm detecting a more PR spin motivation, than sharing his actual world view on fossils. These statements of his, to me, seem like he is trying to tap into the wider public's sentiments on palaeo. I know for a brief time at the beginning of the legal battle he was playing the “evil government tries to stomp on poor little family business” card with interviews. I suspect he and his lawyers were trying to generate sympathy for his side, and hoped the public would pressure the government to back off on the case. Great comments above but…considering the interest in ankylosaurs around here, isn't it about time we started talking about Oohkatokia? lol.